Everything that glitters is not…diamond? But how do you tell? With the help of a Cochranes diamond model, of course. 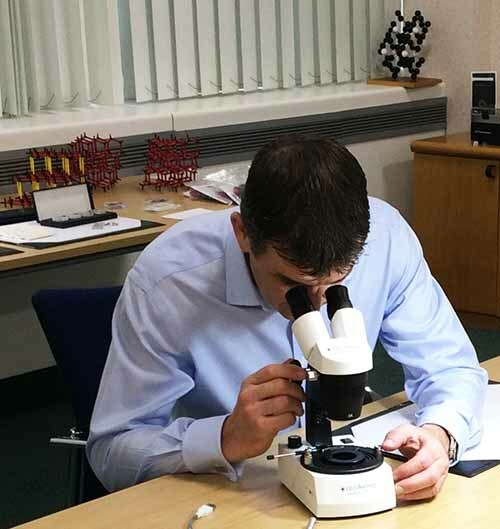 Diamond industry giant DeBeers is currently using our Orbit Colourwave diamond and graphite models in their educational courses for those working in the industry. They are teaching those in the jewellery trade how to spot the real thing from highly sophisticated synthetic diamonds produced in a lab. Being able to get a 3D visualisation of the molecular structure helps to build knowledge from the ground up. “During the course we use the graphite and diamond models firstly, to talk generally about the properties of diamond, compared to graphite, and secondly to discuss impurities in diamond and how this affects its colour. Nitrogen and boron are key atomic impurities in diamond, so we can visually demonstrate this with the models,” says DeBeers Technical Educator Samantha Sibley. At the point when the synthetic product is so good it is not detectable by the human eye, DeBeers offers special screening and verification instruments.